No 117 is a delightful 3 bedroomed end of terrace home that offers spacious open plan living which has been well maintained by the current owners. It is excellently located in this quiet street just a short stroll from local shops and amenities. Upon entering you are greeted by a smart hallway with walnut flooring and good storage under the stairs. Straight ahead is a most inviting open plan kitchen and dining room. The kitchen is to the front of the house and is finished in high gloss cream units with a range of appliances included in the sale of the house. The dining has walnut floor and plenty of storage. To the rear, extending the width of the house, is the living room. The walnut floor continues through and there is a gas fired cast iron stove. French doors lead out to the garden beyond. Upstairs there are three generous bedrooms, two double and one single, and all have built in wardrobes or storage. The master has a well-appointed ensuite shower room and the family bathroom is fully tiled with bath, electric shower and feature mirror on one wall. Outside, the front garden is paved and there is off-street parking and pedestrian side access while the rear garden, which is south east facing, extends to c.44 feet in length and has artificial grass and also has the added benefit of side pedestrian access. 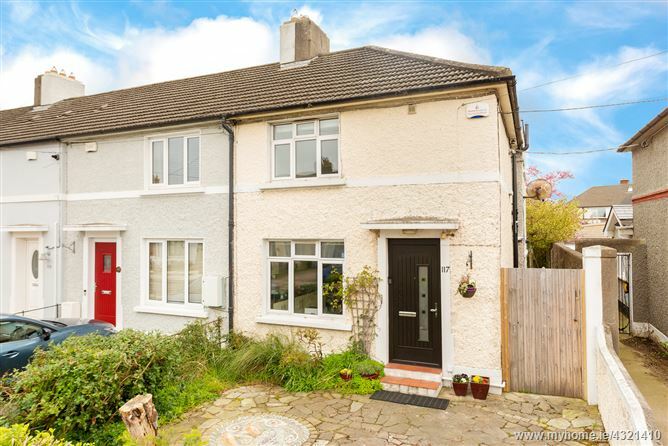 The location is quiet, mature and highly convenient to Terenure, Rathgar, Templeogue and the M50. The immediate area has a host of local shops literally around the corner including Tesco Express, Centra and a local Pharmacy and Bakery to name but a few. The area also has a number of excellent schools including Presentation, St. Pius, Our Lady’s Secondary and Terenure College. The city centre is just 3 kilometres away, easily accessible with the extensive bus routes available from both Terenure Road North and the Lower Kimmage Road. Semi solid walnut floor. Understairs storage. Plumbed for washing machine.